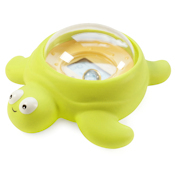 Tortoo is a cute turtle bath thermometer and also acts as a rattling toy, making bath time a joy for both child and parent. Tortoo is completely waterproof. Small and portable with a built-in rattle to make bath time less stressful, Tortoo will provide your child with hours of splashtastic fun. Tortoo is supplied with 2x LR44 batteries which will last about 10 months under normal daily use of 1 hour. Tortoo switches itself off automatically after use.